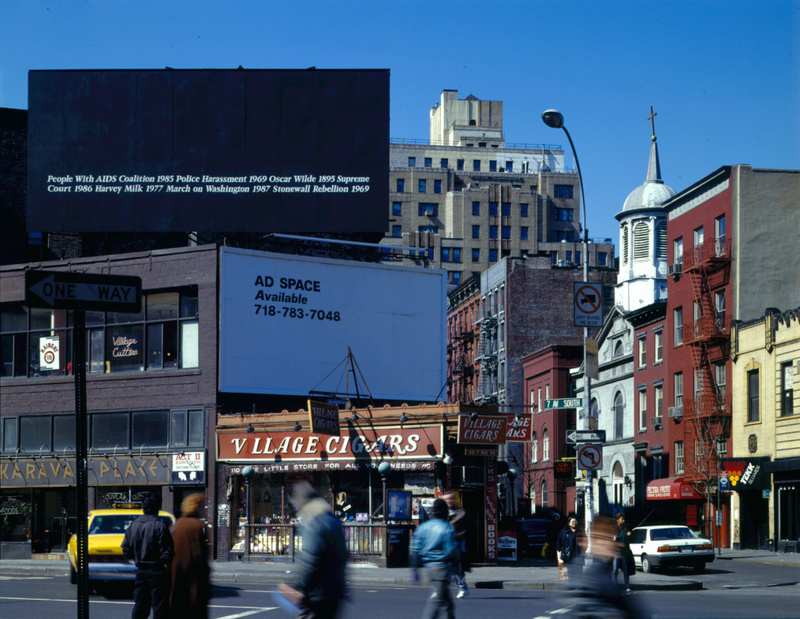 This June, the Public Art Fund will install the seminal billboard, Untitled, 1989, by Cuban-American artist Felix Gonzalez-Torres in honor of the 50th anniversary of the Stonewall Uprising and WorldPride New York City. Set to rise above Sheridan Square’s Village Cigars at the intersection of Christopher Street and 7th Avenue, the powerful project will be on view throughout the month. Untitled, 1989, the first of Gonzalez-Torres’s iconic billboard artworks, was originally commissioned by Public Art Fund 30 years ago for the exact location it will be placed this year. The piece commemorated the 20th anniversary of the historic 1969 riots that helped catalyze the gay rights movement. Gonzalez-Torres’s large-scale signs—all of which feature two lines of white text set across the bottom of a black background—were designed to look like non-artworks and non-ads. “Gonzalez-Torres had a deep belief in the right for individual viewers to experience and interpret the work on their own terms,” the Public Art Fund stated in a press release. There isn’t a single label or an artist’s signature accompanying the installation. As a series of moments and monumental figures with dates beside them, the text isn’t set up in chronological order. It also doesn’t distinguish between public and private histories. It’s open to interpretation by the viewer, but also stands as a “visual reference, an architectural sign of being, a monument for a community that has been ‘historically invisible,’” according to the statement which cites Gonzalez-Torres’s vision for the billboard. Untitled, 1989 is presented in collaboration with The Felix Gonzalez-Torres Foundation with support by Google. It will be on view from June 1 to 30, 2019, in Sheridan Square across the street from the historic Stonewall Inn.